The third week of sales is the charm, with overall album sales up four percent from last week and Country album sales up an impressive 26 percent week over week, with several noteworthy debuts. Jennifer Nettles’ That Girl (Mercury Nashville) is the top Country debut (No. 5 overall), selling 54k units this week. Meanwhile, Rosanne Cash’s River & The Thread (Blue Note Records) debuts at No. 2 (No. 11 overall), selling 19k units. Cash’s album features 11 songs co-written with husband John Leventhal. Jon Pardi’s Write You A Good Song (Capitol Nashville) debuts at No. 3 (No. 14 overall), with 17k units sold. Another noteworthy debut is Cody Johnson’s Cowboy Like Me (Cody Johnson), which debuts at No. 7, selling 8k units. Finally, Home Free, of NBC’s The Sing Off, release their debut album Crazy Life (Columbia Records), landing at No. 8 with 6k units sold. Bruce Springsteen’s High Hopes is the top overall debut this week, selling 99k units. 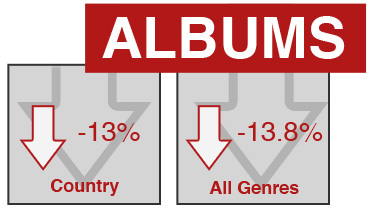 YTD, overall album sales are down 13.8 percent, while Country album sales are down 13 percent. The top Country track is Eric Church’s “Give Me Back My Hometown,” (No. 24 overall), selling 61k units this week (89k RTD). Rascal Flatt’s “Rewind” is the top Country debut, coming in at No. 6 (No. 42 overall), selling 38k units. Additionally, MusicRow’s inaugural Challenge Coin winner Cole Swindell debuts “Hope You Get Lonely Tonight” at No. 8, selling 35k units. Katy Perry and Juicy’s “Dark Horse” continues as the top overall track, selling 216k units this week and 2 million units RTD. Pop powerhouses Shakira and Rihanna’s “Can’t Remember To Forget You” debuts at No. 16 overall with 82k units sold. 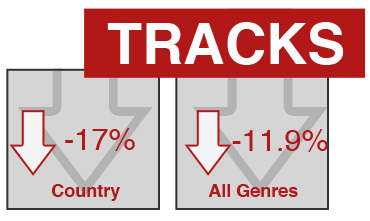 YTD, overall track sales are down 11.9 percent, while Country track sales are down 17 percent. This week’s track sales fell short of sales around this time last year, which saw Justin Timberlake’s “Suit and Tie” debut with 315k units sold and The Band Perry’s “Better Dig Two” sell 70k units. Check back next week to see which Grammy performers experienced a post-show download bump following Sunday night’s show (Jan. 26).